Newcomer Family Obituaries - Edward Earl Bitters 1933 - 2019 - Newcomer Cremations, Funerals & Receptions. Age 85 of Dayton, OH, Earl peacefully left us on April 12, 2019. Spending his young life as a Methodist pastor’s kid throughout Ohio taught him the importance of service and the values of living frugally and simply, principles he followed throughout his life. Earl also spent his life making people smile with his friendly face and corny jokes. After a career in retail hardware, he “retired” to work and greet customers at the Huber Heights Walmart. His childhood memories of attending the circus--which he continued as an adult--led him to become a professional clown with the personas Mr. Bumbles and Wally. 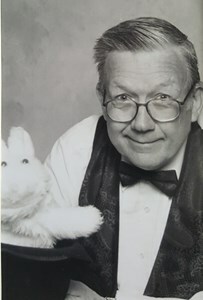 He also served at Dayton Children’s Hospital as a tour guide, clown, and information desk volunteer for many years. Earl loved Wayne HS football, followed several regional theatre groups for young people, and enjoyed waxing philosophical about the changing retail scene. To share a memory of Earl or leave a special message for his family, please click the "Share Memories" button above. Add your memories to the guest book of Edward Bitters. I am so sorry for your loss. Earl was one of the first residents at H&H that I met. He helped show my folks, Ralph and Jean how things were done there and made them feel welcome. I will always have fond memories of Earl. Loved Uncle Earl visiting my girls as Clown Wally, sending them stickers in the mail, and giving my dad the golden plunger! His rendition of Oh, Christmas Tree was one of a kind! So many memories over so many years ; from shooting hoops on the garage rim on Harker street to the happy bud singing his own rendition of " O' Christmas Tree"!